On Thursday November 10 2011, the Israeli authorities handed over demolition orders for 17 structures affecting 72 people, in Al Hadidiya, Jordan Valley. More about this, as well as why Tony Blair received a letter from the Al Hadidiya community below (ook in Afrikaans). UPDATE 07.01.2012: To our relief the Yanoun Team 42 reported that all the demolition orders in Al Hadidiya as well as those in eight surrounding communities were frozen – and signed as such by Ehud Barak. 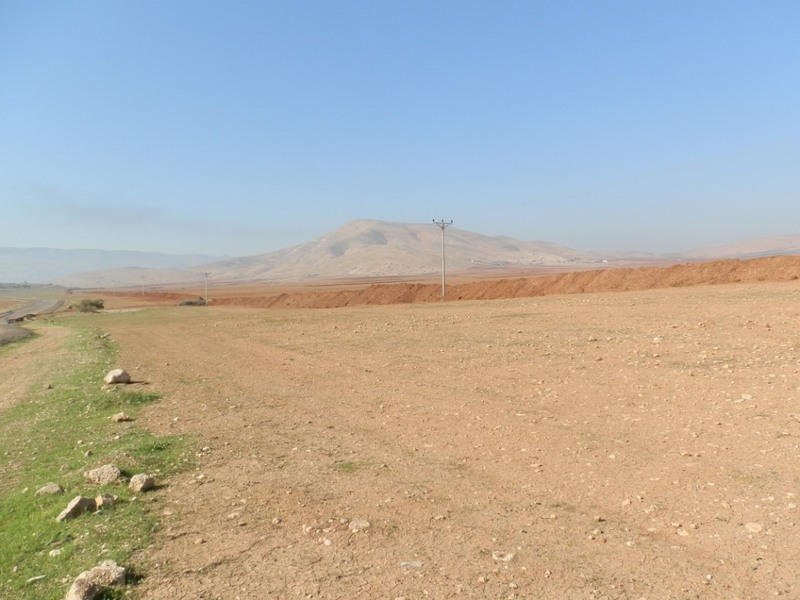 HOWEVER the team also reported home demolitions in Fasayil al-Fauqa and Fasayil al-Wusta, two other communities in the Jordan Valley. Remember that it is winter – and very, very cold. 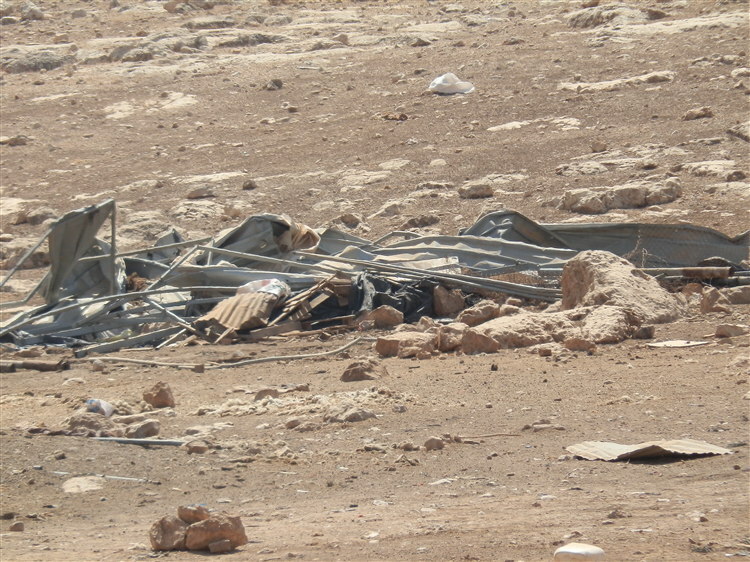 (These demolitions started on the day that we left Yanoun, as we were waiting for our transport to arrive. It was terrible to leave like that.) No news to date on the letter we handed to Tony Blair at the Quartet’s office in Jerusalem. 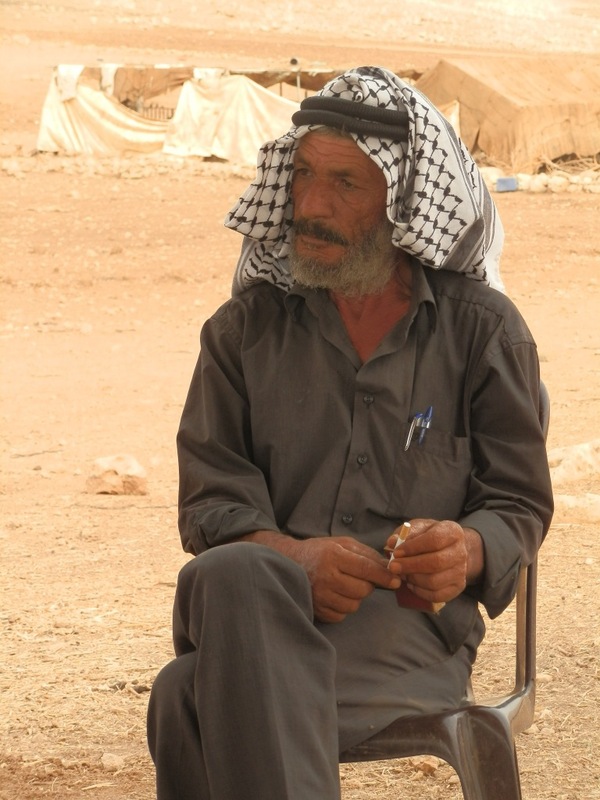 Al Hadidiya is a Bedouin community of some 112 permanent inhabitants. 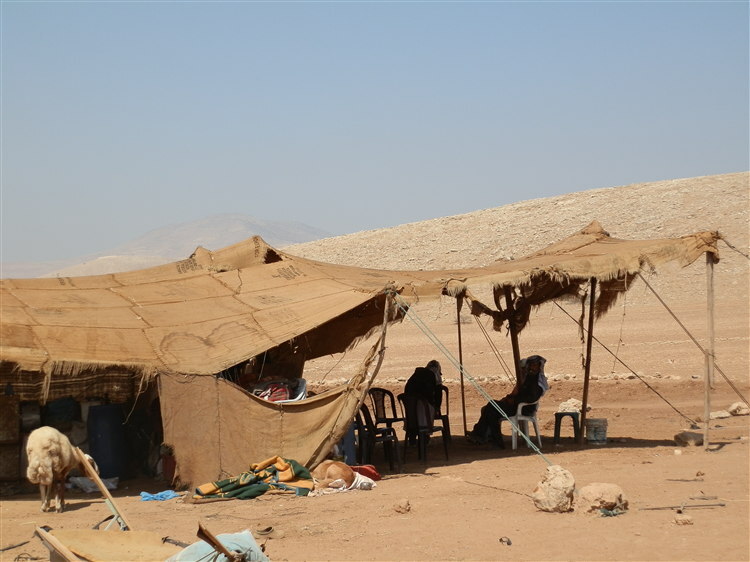 a further 130 inhabitants return to villages near Tubas during the two cold winter months as Israeli forces have already destroyed their homes and they have not found the necessary means to build shelters that can protect them from the winter cold. In fact, many of the families have already suffered several home and property demolition in clear violation of international law and human rights. Since 1998, the Israeli occupation authorities have implemented a systematic and continuous drive to permanently expel the Palestinians residents of the Jordan Valley from their lands. Most of the people in Al Hadidiya have already had their homes and/or animal shelters destroyed more than five times by the IDF. 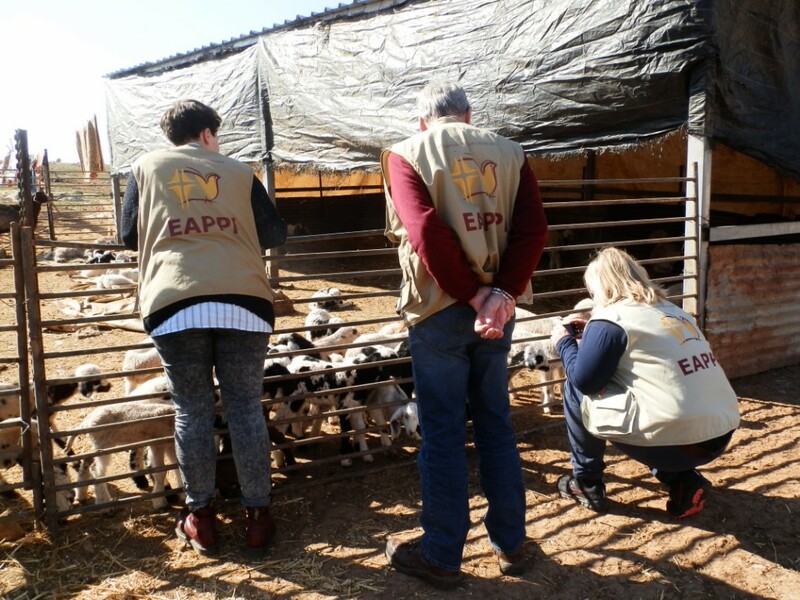 The people in Al Hadidiya are entirely dependent on rearing animals as they do not have sufficient water for agriculture. 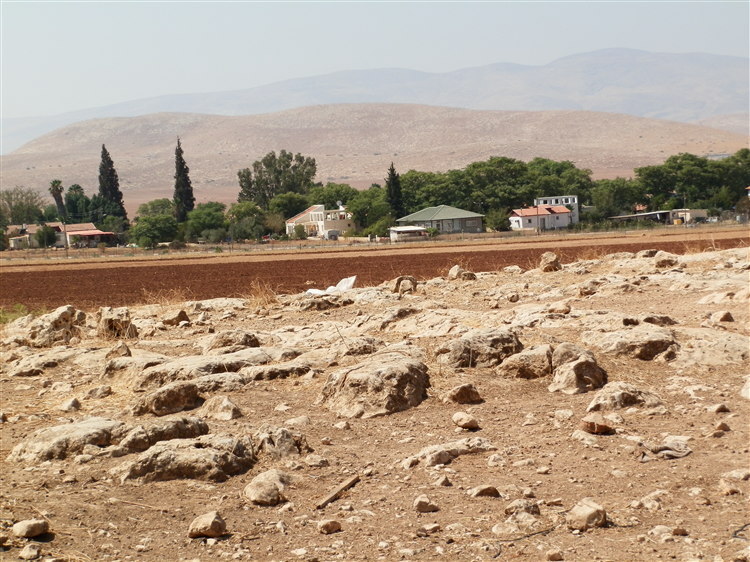 In the nearby Jewish-only settlements of Ro’i and Beqa’ot, agricultural produce is farmed using hi-tech methods and with an abundance of water. 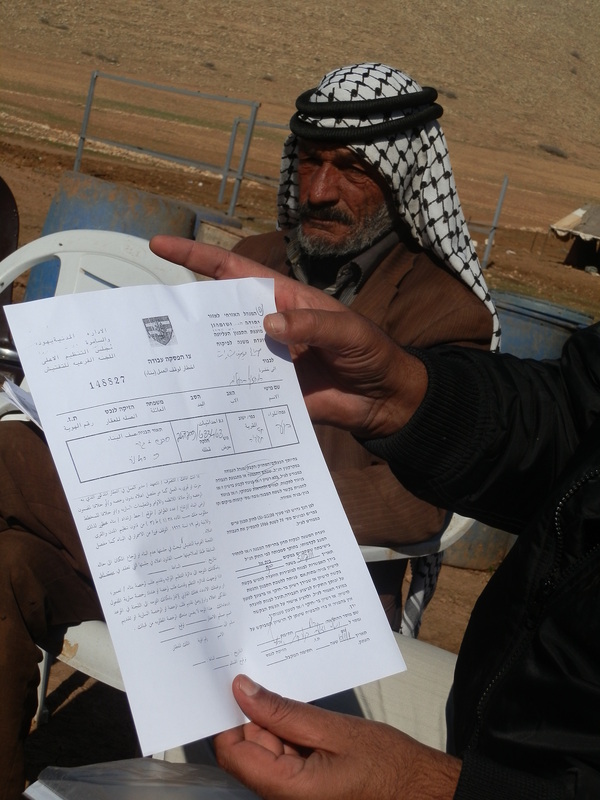 One of the 17 demolition orders without ID numbers, Abu Saqer in the background. 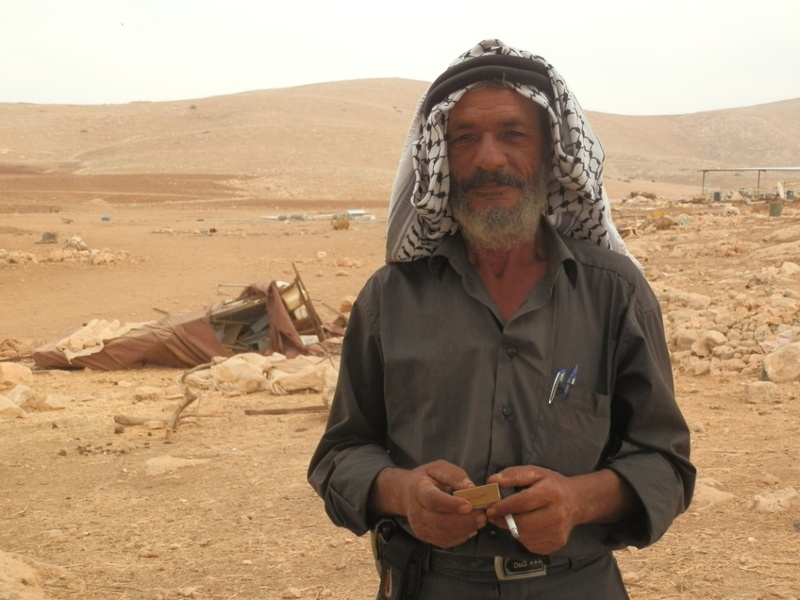 The latest orders were simply left in a shelter on Abu Saqer’s farm where he later found it. None contain ID numbers. The community is assisted by a lawyer. They have papers from the Ottoman period (thus before the Jordanian and the British reigns) to show that they live on their own land. While the international community discusses Palestinian statehood, Israel is continuing the ethnic cleansing and colonization of Palestine with further displacements in the Jordan Valley. 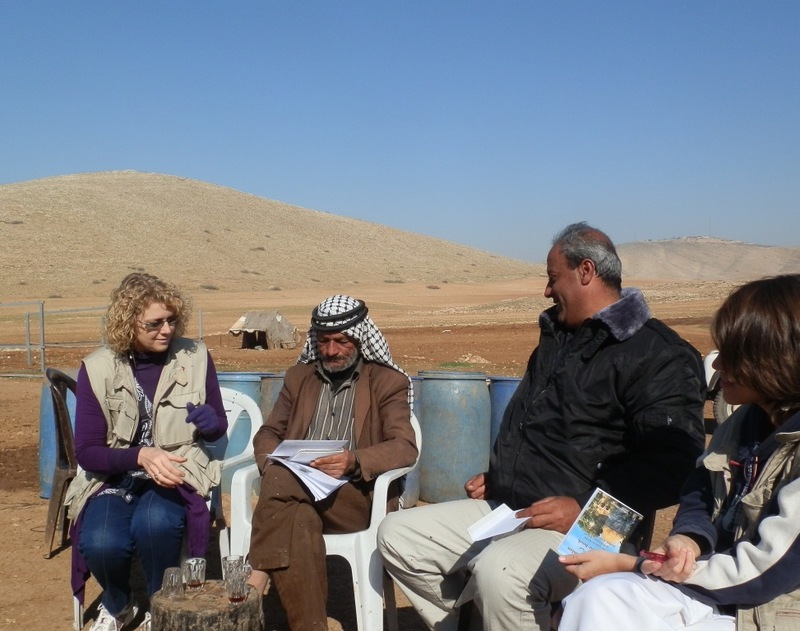 The new Yanoun team (Group 42) discussing the demolition orders with community leader Abu Saqer on his farm. 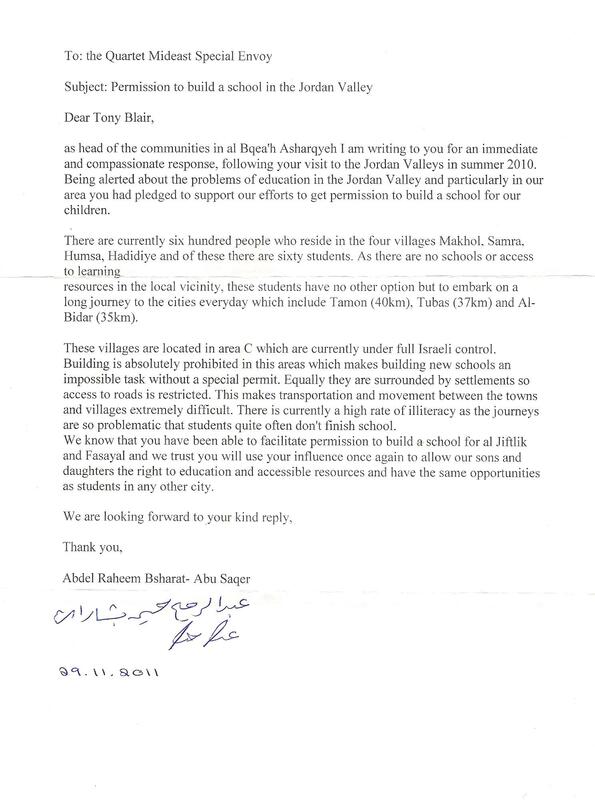 One of the first things our team did, was to agree with Abu Saqer that he would write a letter to Tony Blair on behalf of his community to ask for a proper school building. We, the Yanoun EAPPI team 41, promised to deliver this letter to him. My colleague Linda Baily handed the letter to the Office of the Quartet in Jerusalem on behalf of our team during the last week of our term. Abdel Raheem Bsharat-Abu Saqer (60) greeted us energetically, his wiry figure in black against the pastel shades of the untilled land like a pen on a pale page. It was around noon and blisteringly hot. He farms with sheep and plants oats and wheat in the winter when it rains. We climbed the rocky hill behind the house. On the other side, beyond the dry dust beneath our feet, lay a lush green strip of land with permanent structures – Roi, an Israeli settlement. 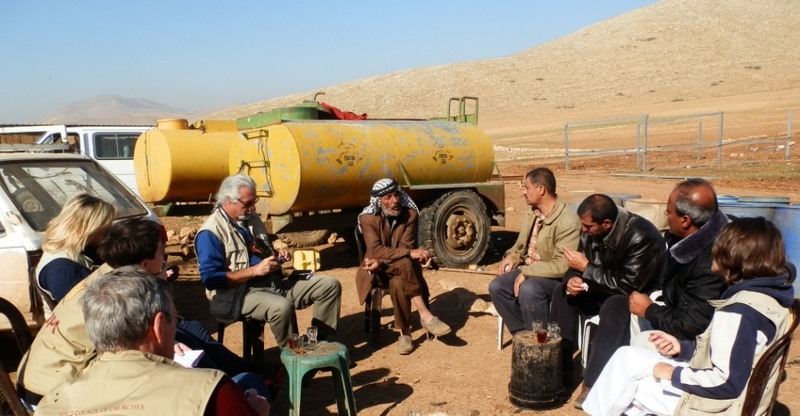 Water is precious and scarce in the Jordan Valley. 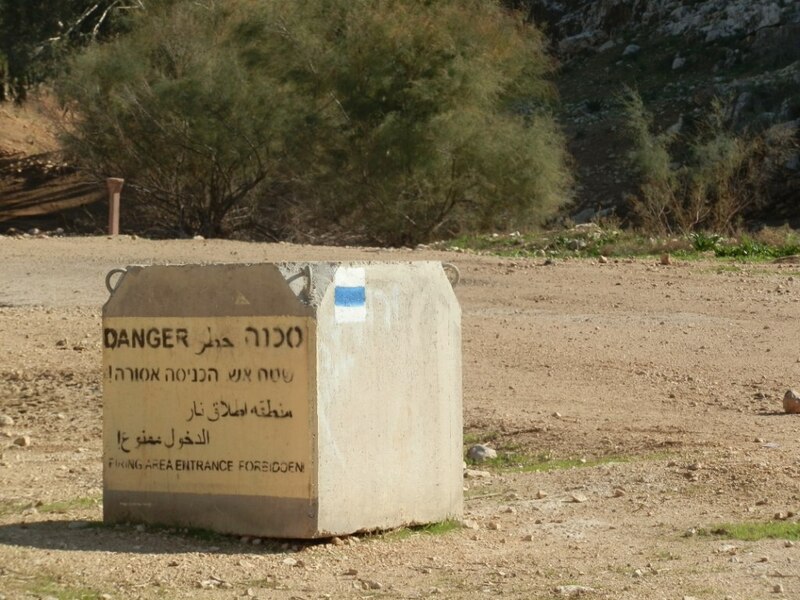 Illegal Israeli settlers are allocated by far the greater portion of the water (45 million cubic metres per annum for 64,000 people at subsided rates, compared to the unsubsidised 31 million cubic metres allocated to the 56,000 Palestinians in the valley in 2008). Abu Saqer’s farm in the foreground, with the illegal Israeli settlement Roi in the background. 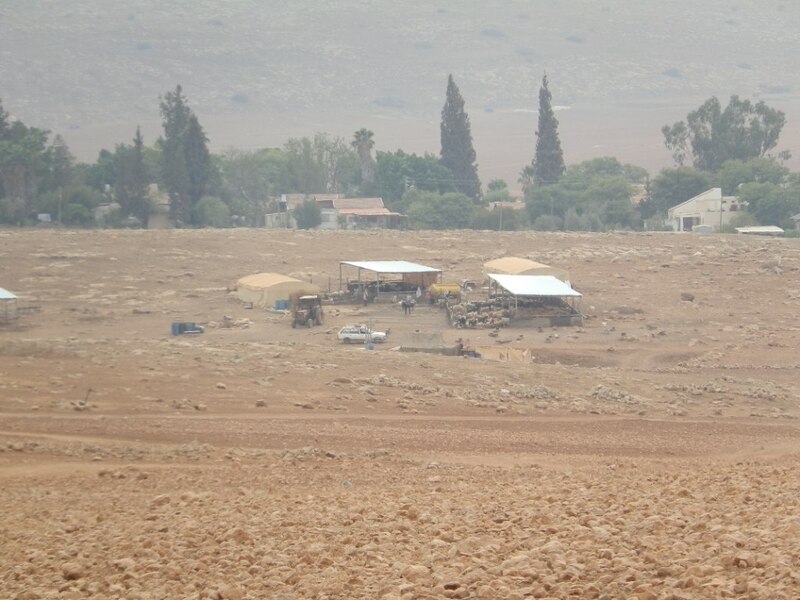 As we made our way back down to the home built of canvas and reeds and other portable materials, the Israeli military base on the opposite hill caught my eye. Abu Saqer’s previous home was demolished by the Israeli Defence Force while he had taken his wife to hospital for the birth of their youngest child. “They are stealing our water. They plant flowers in the settlement and we don’t have water to drink. The Israeli politics is to move us – should I then live in the air? Our message to the world is to look at us as human beings. I am not a political person or a negotiator, but I need to feed my family. My message is for them to look at us as people who want our children to be educated. I now need to drive a 35-40 km detour each day when I take my children to school because they closed my gate. This means that our children are in the village while we are here and we cannot take care of our children and their school work. My message to Great Britain is to stop helping the Israelis. They have helped them since 1916 until now and this is why the Israelis continue to break the law. My second message is for the United States of America. The tax payers in the USA should know that they support the Israelis to fight us. My message for the Israelis is you cannot take our land. We will not leave our homes like those who left their properties in 1948. Not all Israelis are the same and our aims are supported by many organisations and individuals in Israel and in other parts of the world. We hope that this awareness of our humanity will grow. We want to live in peace with the Jews and Christians. Peace and love is the essence of all three our religious traditions. The current Israeli politics cannot last forever. We hope the situation will change because people all over the world appreciate us. We want a peaceful solution. If things are not changed in a peaceful way, then I have no solution for our children. But we need a true state and freedom. It should be democratic and by election. Then we should have a school building here and not just a tent which is too cold in winter and too hot in summer. Then a letter to Tony Blair will not be necessary. But if we are a state and we still have no water, and if the soldiers continue to demolish water wells without permits as in An Nassariya, it will mean nothing. We need to have a proper infrastructure. Die songedroogde boer groet ons met vitaliteit, sy skraal figuur in swart soos ‘n pen afgeëts op die blad van die pastelkleurige, onbewerkte landskap. Dis ons eerste besoek aan die gemeenskap van Al Hadidiya in die Jordaanvallei. Dis in die middel van die dag en warm. Hy boer met skaap en plant hawer en koring in die winter as dit reën. Hy is nog besig met enkele sake en ons stap solank oor die klipperige heuwel om die wêreld te bekyk. Aan die anderkant van die dor stof onder ons voete lê ‘n lieflike groen strook met permanente geboue. Dit is Roi, ‘n (onwettige) Israeliese setlaarsgemeenskap. Water in die Jordaanvallei, soos elders in Palestina, is kosbaar en skaars. 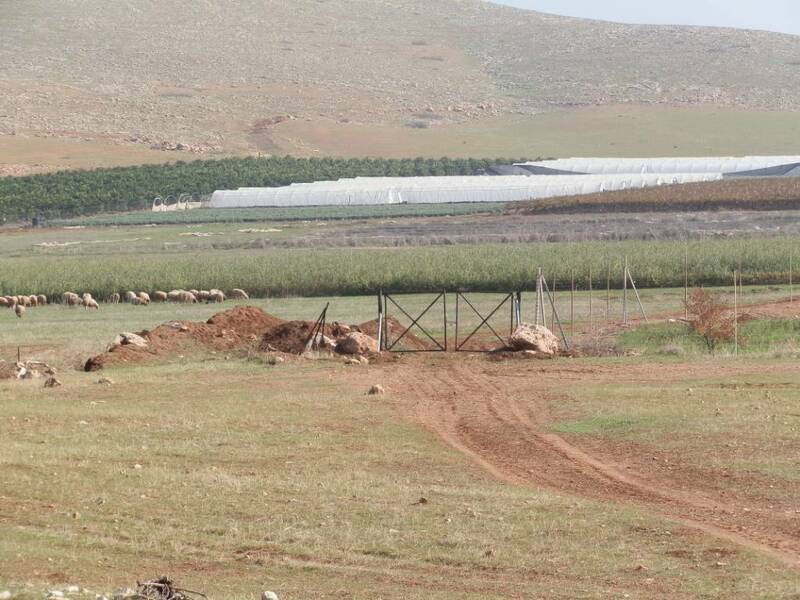 Die Israeliese setlaars kry by verre die meerderheid daarvan (45 miljoen kubieke meter /jaar vir 64 000 mense) teenoor die 31 miljoen kubieke meter (in 2008) vir die 56 000 Palestyne in die vallei. Ons draai terug en my oë val op die Israeliese militêre basis op die oorkantste heuwel. Ons stap terug, af na die huis van tente, riete en ander vervoerbare materiaal. Abu Saqer se vorige huis is deur soldate vernietig terwyl hy sy vrou hospitaal toe geneem het vir ‘n bevalling. Ons is bly oor die glasies tee wat ons aangebied word. Ons stel onsself voor en Abu Saqer wil by my weet hoe dit was om in ‘n land van apartheid te woon. Ons gesels. Hy meen dat Palestina ‘n speelbal is vir wêreldmagte. Dalk gee hulle geld, sê hy, maar hulle harte is nie oop vir ons nie. Hulle gee nie regtig om wat van ons word nie. Om nou as ‘n staat verklaar te word, gaan volgens hom niks beteken nie. Die land het hulp nodig met die opbou van ‘n infrastruktuur. Abu Saqer se vraag oor hoe dit was om in ‘n land van apartheid te woon, en hoe dit nou met ons gaan, bly my by toe ons wegry. Earth banks created by the IDF prohibit Palestinians to reach their own land in the Jordan Valley. a trail marker (i.e. if you’re an Israeli, go ahead and enjoy nature). There are many of these in the Jordan Valley. 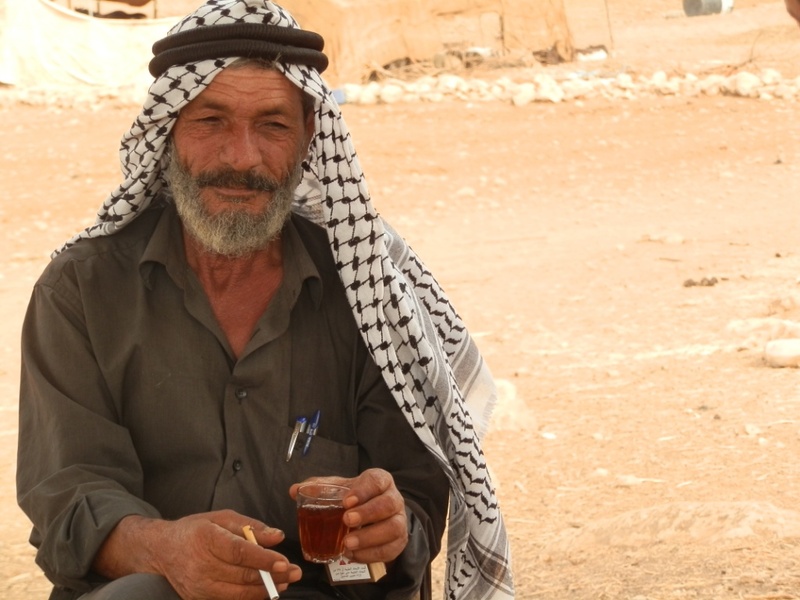 The entrance to Abu Saqer’s farm has been blocked by inhabitants from the illegal Israeli settlement Roi, and he now has to use a 15 minute detour through the veldt to reach his home. ai liewe Marthie…ek lees jou berigte met belangstelling. Dit is goed om jou kant te hoor terwyl ons hier ter plaatse die ‘ander’ kant hoor…ons kan maar net bid…en dit doen ons…ook vir jou! Dis so vreemd – Suid-Afrika ondersteun Palestina amptelik, maar die Afrikaanse pers (veral) assosieer baie sterk met die Israeliese narratief. Ek probeer my aller beste om iets in die Afrikaanse koerante te kry, maar sover is ek onsuksesvol. As julle maar net kon sien wat ek hier sien, my woorde en foto’s voel totaal ontoerreikend vir dit wat ek alles ervaar. Die ooglopende wreedheid en die ooglopende oortreding van internasionale menseregte wette. ‘n Israeliese hof sal een ding besluit, en dan sal die regering eenvoudig iets anders implementeer en NIKS GEBEUR nie, mbehalwe dat Palestyne se eiendom vernietig of gekonfiskeer word. Ons rapporteer dit alles aan die die VN. Dis so goed om te weet iemand probeer ‘n verskil maak. Baie sterkte,lig en liefde vir span 41. Ek sukkel om met jou kontak te maak! Het lang storie geskryf wat nou iewers in die cyber space rondswerf! Wens ek kon lank en diep met jou gesels want ek verstaan bitter min oor wat om jou aan die gang is! Moet miskien met Theunis gaan koffie drink sodat hy my meer kan vertel. Weet net ons dink baie aan jou en glo dit sal goed gaan met jou en vir jou `n goeie ervaring wees.